A weekly newspaper has launched a new edition for part of its patch in a bid to broaden its readership. The Cornishman has created a new edition for St Ives and Hayle, which will have a separate splash for the towns and and stories relevant to readers from that area. The paper, which has traditionally only had one edition, has long been seen as the paper for Penzance, where its office is based, but it is hoped the new edition will allow it to reach more readers in the two neighbouring towns. It hit the shops for the first time on Thursday with a host of reader offers to celebrate the launch, including free chips, ice cream, coffee and pasties and goody bags were given away with the paper in a local Tesco supermarket. Editor Jacqui Walls said: “Launching a new splash edition of The Cornishman is a huge step and underlines our commitment to the patch and to growing our readership. 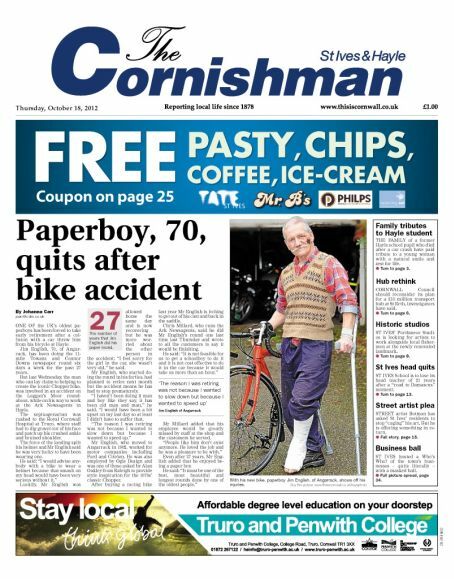 This week’s edition includes stories about a 70-year-old paper boy from Hayle forced to retire early after being knocked from his bike, the redevelopment of St Ives’ famous Porthmeor Studios, a huge setback for the council in the development of a St Erth transport hub, the death of a former Hayle schoolgirl after a tragic accident and the retirement of a long-standing St Ives head teacher.